Victor Sharov, a flexible Real Estate Agent and Property Manager at the Sun Pacific Group LLC. Thank you for visiting Hawaii-Investor.com! This site is dedicated to Hawaii real estate. If you have definitely decided to buy any real estate in this paradise place, this website is an excellent choice! Hawaii is a mecca of the sun and sand. Its natural beauty, warm tropical climate, clear water and high waves attract tourists and surfers from all over the world. Regarding the real estate market, Hawaii boasts its stable prices for real estate. In addition, real estate is at its lowest level. Taking into account that Hawaii is an international resort, you won’t have problems renting out your Hawaii property. Moreover, it will be profitable. Hawaii real estate is always in great demand, so you will definitely find a buyer for your real estate. And one more fact about Hawaii, according to the survey, this state occupies the second place in the list of all American states where people are satisfied by their quality of living. So, Hawaii has all conditions to ensure your decision is a wonderful choice in buying real estate here. If you are planning to sell or to buy real estate in Hawaii, you need an experienced real estate agent who will help you make a right choice and save your money. I am ready to offer my services as a Real Estate Agent who can provide you with the information you need about the real estate market in Oahu Island. I am employed as a flexible Real Estate Agent at HLR Hawaii Pacific and as a Property Manager at the Sun Pacific Group, LLC. I have experience for over 9 years in this field. My experience in this field will help you save your precious time and money. I can offer you a variety of real estate and will help you choose the house or apartment you will feel comfortable in. I look forward to being your “Realtor for Life”; that is why I always give you the real information on your issue, providing you with the best advice and straight to the point. I assist you through the whole process and together we make a final decision that can fit your budget and satisfy your expectations and desires. Give me a chance to show you what I can do for you! If you are interested in Buying or Selling property on O’ahu, click on the image below. Considering buying real estate in Hawaii? Be sure that you made a perfect choice. 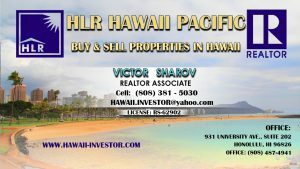 The Hawaiian real estate market can please you with its stable prices, high rent prices (so it is profitable to buy real estate in Hawaii) and low interest rates. But these are not the only reasons why you should buy real estate here. Hawaii is a popular international resort so you could acquire a small part of it and get the opportunity to rest here or to rent out your flat or house. Besides, you can get the flat/house with a romantic view of the ocean. If you have decided to buy he real estate in Hawaii, let me introduce you with the whole procedure of our cooperation. Consultation: I can give you in-person or phone consultation or you can even ask me your questions via e-mail. The main goal of the first consultation is the exchange of information. You should tell me what kind of real estate you are looking for, the area of its location, your preferences and requirements to it, and, of course, your financial capacity. This information can give me the idea of what you are really looking for and what I can offer to you. In my turn, I can give you the whole picture of the Hawaiian real estate market, its features and laws and introduce you with the buying procedure. Mortgage broker: Before we start searching the real estate, you should consult a mortgage broker. If you need a mortgage to buy a real estate, the mortgage broker issues you a pre-approval letter confirming you can afford to pay the mortgage. If you don’t need a mortgage and you can pay the whole amount at once you need just the asset verification letter confirming you have the sufficient amount of funds on your deposit. I can help you to find a reliable mortgage broker who renders his/her services for an affordable price. A competent broker will help you save your time. Showing available real estate: Next, we can start looking for the flat/house basing on the price range that fits your finances and your criteria to your future real estate. We can view flats/houses on-line and then see those you liked in person. It is very important to look at your potential property in person to evaluate its condition to determine its advantages and disadvantages and define whether it corresponds to the price established by the seller or not. Document preparation: So, eventually you found the house/flat of your dreams and you are absolutely sure you want to buy it. At this stage I contact a seller’s agent to find out the seller’s requirements that will help us to prepare a complete package of the documents. We also discuss the price, terms and conditions of the purchase deal. If so required, I can open a real estate inspection to make sure about its good condition. Real estate is yours: All the procedure of buying real estate is over and you are a lucky owner of the Hawaiian real estate. First of all hire a property manager to save your precious time and get the results. 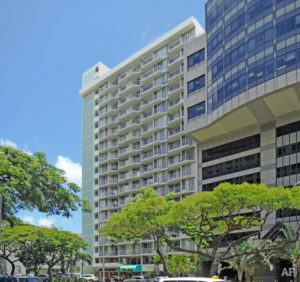 I would like to offer my services as a property manager, employed at Sun Pacific Group, LLC, a full service property management company in Oahu Island. Now you don’t need to spend your time on managing your property. I will show your property to potential tenants and manage all the procedures connected with rental agreement signing while you will be going about your own business. Moreover, you will save not only your time but also money, because you shouldn’t pay set-up fees, rental application fees, and property fees are lower than the market suggests. If I am sure about the solvability of the tenant, I draw up a rental agreement and sign it with him/her and then collect security deposit. Owner of the property is given a copy of this agreement.7. When the property is already rented or is going to be rented I check its condition before and after its occupancy and give to the owner a copy of the initial inventory and condition form.8. If the property needs to be repaired I arrange this using the services of only reliable handymen, plumbers, electricians and other professionals registered in my list.9. Before the tenant settles in your house or flat I collect the rent from him/her. In case of payment delay I charge late fees and follow up with their collection.10. If the tenant refuses to pay I evict him/her without collection agency or attorney interference. If so required I represent the property owner in courts.11. Every month I prepare rental reports on income and expenses with copies of receipts for paid invoices attached. When the tenant is going to vacate the rental I check its condition and prepare return of security deposit letter with the deductions for unpaid rents, late fees and damages. In addition, I assist the owner with the annual report on income and expense report. It will make it easier for the owner to prepare the income tax return. Moreover, I prepare the required IRS Form 1099 and mail the copies to the State authority and to the owner. 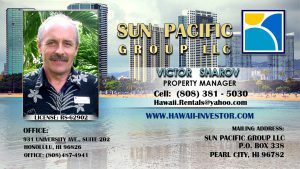 Victor Sharov, a flexible Real Estate Agent and Property Manager at the Sun Pacific Group LLC. Please call (808) 381-5030 to set up an appointment.